The recovery system consists of two conveyor units. The debris col- lection unit is a stainless steel conveyor that leads up to the de- bris collection equipment. The oil- handling unit is a powered, 37V2- foot-long by 6-foot-wide PVC belt that loads oil into the vessel's cargo tanks. The belt is driven by a Char-Lynn hydraulic motor. The dynamic inclined plane (DIP) con- veyor is located in the forward half of the hull, behind the debris conveyor. Gulf of Mexico oil tracts owned and managed by the company. These two Pemex fireboats are among the largest in the world. The 500-gt Pemex 652 has an overall length of 150 feet, a beam of 32 feet and a height from the deck to the top monitor of 40 feet. Operating draft is 11.8 feet, cruis- ing range is 250 miles, and top speed is 16 knots. MTU diesel engines, each with an output of 1,725 bhp at 1,400 rpm. Two Reintjes reduction gears transmit the power to the two Os- borne propellers. AFFF foam solution, and spraying it onto fires at a rate of up to 25,000 gpm. The three main mon- itors (nozzles) manufactured by the Swedish Foam Fire Extin- guishing Company can each han- dle 5,200 gpm. Cranes can position two more Stang monitors 75 feet above the water surface to handle 2,600 more gpm. The vessel car- ries 6,000 gallons of foam concen- trate to mix with the water. The hull of the fireboat is con- structed of a special Alcan alloy that includes magnesium and manganese. Pemex specified alu- minum because of its light weight and because the high superstruc- ture of the vessel would have been impossible without it. Aluminum is also corrosion-resistant, even in salt water, so maintenance can be kept to a minimum. SERVICE - GULF AND WEST COAST 24 Hrs. Service VI-CORE INC. - Ivo Dabelic 713-643-7715 radiotelephone, depth sounder, ra- dar, loudhailer, engine controls, and hydraulic steering controls. Schottel bow and stern thrusters enable the vessel to maneuver with ease. This permits precise station-keeping and allows the fire- fighting equipment to be posi- tioned quickly and to the best advantage. 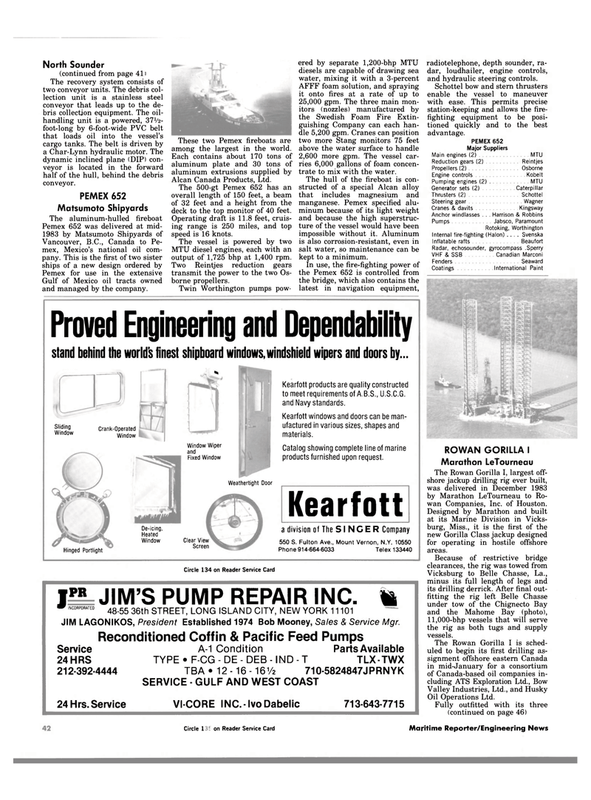 The Rowan Gorilla I, largest off- shore jackup drilling rig ever built, was delivered in December 1983 by Marathon LeTourneau to Ro- wan Companies, Inc. of Houston. Designed by Marathon and built at its Marine Division in Vicks- burg, Miss., it is the first of the new Gorilla Class jackup designed for operating in hostile offshore areas. Vicksburg to Belle Chasse, La., minus its full length of legs and its drilling derrick. After final out- fitting the rig left Belle Chasse under tow of the Chignecto Bay and the Mahome Bay (photo), 11,000-bhp vessels that will serve the rig as both tugs and supply vessels.